Yesterday was another spectacular day on the Bay of San Francisco. The Blue Angels were working up in the air and the America's Cup sailors were working at sea level. It was a historical day too because I think that today was the largest crowd to ever watch a sailboat race in person. It would be hard to get an official count with all the offices, apartments, houses, Russian Hill, Telegraph Hill, bridges, Marin headlands not to mention fans along shorelines of Crissy field, Marina Green, Pier 39, plus about 500 boats out on the bay, but I would not be surprised if it wasn't 500,000. And if you think that's impressive, wait for Super Sunday. Both Artemis Racing teams qualified for the Match Race semi finals but unfortunately both Artemis boats lost their races. 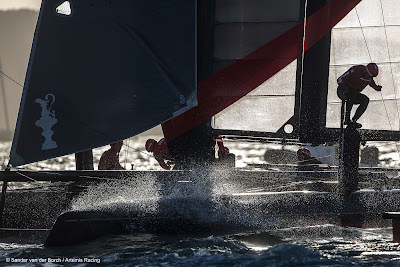 Onboard Red, we had a great start against ETNZ, led at the first mark but did not get into the boundary far enough to maintain "protection" when ETNZ came at us on starboard. Lesson learned. Thereafter the track was pretty one sided with the current on the change from flood to ebb therefore rendering a "split" very low likelihood of success. So we followed and kept it close in case the Kiwis made a mistake, we would be able to capitalize. But they did not so we lost by 10 seconds or so. 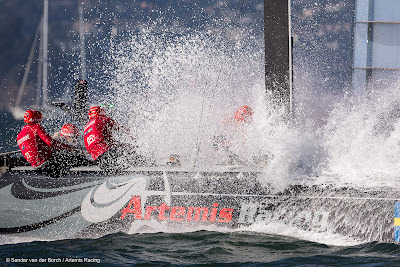 In the other match which featured Artemis White against Oracle Spithill, Oracle had a better start and maintained the lead for the 13 minute duration of the race. Today is "Super Sunday" named that way because there is just one fleet race and it is for all the marbles. 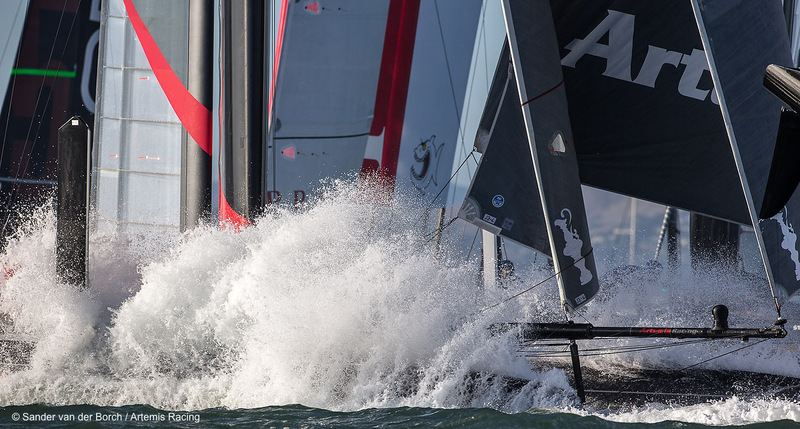 Typically, any of the top 5 boats can win the event if they can win on Super Sunday. This makes Sunday, "Super Exciting". The points on offer for Sunday are: 40 for first place, 25 points for second and 20 for third, 16 for 4th and 12 for 5th. So the event is very winnable for Artemis White who is in second place with 52 points trailing BAR who is leading with 63. 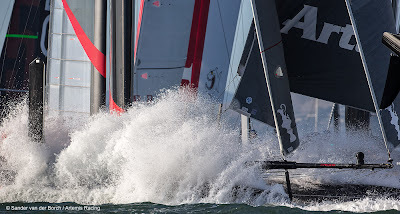 It would be a big stretch but also possible for Artemis Red, currently on 39 points, to win if we win the race and Ben Ainslie Racing is 5th. In sport, you cant ever ask for more than that...a shot to win it all on the last day! And that's where we are with both Artemis boats!